1. Preheat the oven to 100°C, gas mark ¼. Draw a 23cm circle onto a large sheet of non-stick baking parchment and place pen-side down onto a flat baking sheet. 2. Place the egg whites in a clean bowl with the cream of tartar and whisk using an electric mixer until soft peaks form. Add half the sugar, a tablespoonful at a time, while continuing to whisk, until the meringue is glossy and thick. Mix in the remaining sugar, followed by the cornflour and the vinegar. deep circle. Cook in the oven to bake for 2 hours until crisp on top. Turn off the oven and leave to cool completely before removing from the oven and carefully sliding onto a serving plate. 4. Mix the curd with the zest and orange extract. Gently fold the curd into the cream to give a marbled appearance. 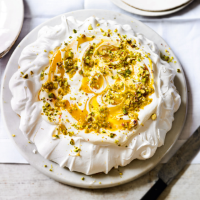 Spoon the orange cream onto the Pavlova, top with the passion fruit pulp and scatter with the pistachios.